Forget building equity over decades and decades. Increasingly, leasing a house over a much shorter span is the norm in South Florida, where the renting of suburban-style houses appears to be on an upswing, potentially leading to pressure on home prices. For many would-be buyers, housing prices are too steep and interest rates are climbing, while wages seem stuck, according to developers, investors and brokers. Such conditions make renting attractive. Adding to demand, brokers said that the new federal tax law — which limits property tax deductions — has brought more out-of-staters to South Florida, where many are renting before they buy. At the same time, foreclosures — a feature of the last recession that had seemed to fade as a concern in recent years — appear to be inching upward, and investors are snapping up bank-seized properties from Miami Gardens to Palm Beach Gardens, brokers say, with the aim of becoming landlords. Measuring the trend with specificity can be difficult, as few major firms track the house-rental segment across the tri-county region. But anecdotal evidence is piling up, including the fact that investor groups, including those from beyond the Sunshine State, are swarming. In July, Cerberus Capital Management, a New York private equity group, picked up about 200 houses in Miami-Dade, Broward and Palm Beach counties from Miami-based Property Investment Advisors Group. Cerberus paid $47 million, or an average of about $235,000 per home. Property Investment itself began scooping up distressed homes during the recession for as little as $80,000 in some cases, according to news reports.Similarly, last December, as part of a larger deal, Amherst Holdings bought 174 South Florida houses from Broadtree Residential, a real estate investment trust. The financial services firm from Austin paid $25.7 million for the homes, 165 of which are in Palm Beach County and nine are in Broward. Similarly, last December, as part of a larger deal, Amherst Holdings bought 174 South Florida houses from Broadtree Residential, a real estate investment trust. The financial services firm from Austin paid $25.7 million for the homes, 165 of which are in Palm Beach County and nine are in Broward. Amherst has been on a tear as of late, buying and selling rental houses across the country. It acquired 6,000 homes in 2017 alone, which accounted for about a fifth of all the rental houses that traded nationally, according to news reports. Since 2012, the firm, which also has offices in New York, said it has raised more than $2.5 billion of debt and equity capital for rental acquisitions. A call to an Amherst spokesperson was not returned. In August, Front Yard Residential — a Virgin Islands-based real estate investment trust — grabbed 325 houses in Broward as part of a $485 million takeover of HavenBrook Homes, a Georgia-based property manager. 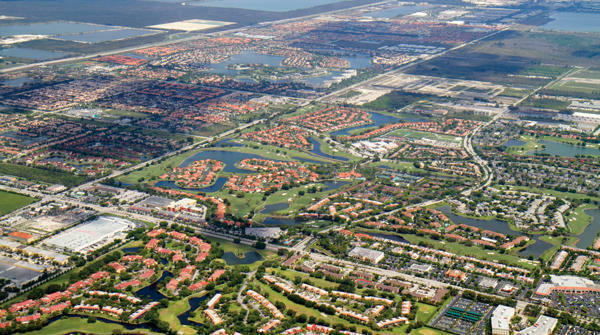 The Broward homes were valued at $25.4 million. Brokers say they expect even more outside capital to flow into the single-family-home rental market soon. A joint venture headed by Canada’s Tricon Capital is ready to deploy $750 million in that space, some of which is expected to funnel to single-family homes in housing markets such as South Florida, brokers and landlords say. Eyes are also on New York-based Premium Partners, an aggressive investor that as of September 2017 owned 22,000 homes in 15 cities and has raised $1 billion to purchase 26,000 more, according to Bloomberg. And the company joins national powerhouses such as Invitation Homes, a Dallas-based entity owned by the Blackstone Group and founded in 2012, which has spent more than $10 billion on 83,000 homes. Many of them are in South Florida, a search of public real estate databases shows. Dallas Tanner, the co-founder of Invitation Homes, was unable to comment by press time. Local players are active, too, including Miami-based Exceptional Homes Restoration, which in April purchased 52 South Florida houses and one small apartment building for $7.8 million. The seller was the Gram Group, a Spanish investor that began buying foreclosures in 2008, said World Class Realty’s Dahan, who renovated the properties on behalf of Gram. “We had an exit strategy,” he said. Just a week after that deal, Exceptional flipped the homes for $13.16 million to TGCB Holdings, a Miramar-based firm; the fact that the firm almost doubled its money — and so quickly — shows the strength of the sector, brokers say. Joshua Wagschal, a principal of Exceptional Homes, did not respond to an interview request. An email sent to Jeffrey Rose, a TGCB principal, went unreturned. Most of the properties TGCB acquired are in middle-class sections of Broward far from the beach, such as 5733 Wiley Street, a modest pink-stucco four-bedroom ranch-style house on a windswept block in the Lawn Acres section of Hollywood. A lender foreclosed on it in 2011, according to Zillow.com, before selling it to Gram for $74,000 a few months later. TGCB then paid about $271,000 for the property, which means the value almost quadrupled in seven years. But that may be close to a ceiling for that kind of property, brokers say, which means rentals might be the way to go. A two-bedroom house in Broward might fetch $1,500 a month, while a three-bedroom might get $1,700, they add. In some ways, investors who snapped up properties at bargain-basement prices in the depths of the recession are lucking out, said Rebel Cook, the president of Rebel Cook Real Estate, based in Palm Beach Gardens. In the Cabana Colony section there, near Interstate 95, investors moved on many homes with the expectation that developers would someday raze them for luxury housing, Cook said. But those towers never appeared, so investors have become de facto landlords. If distressed homes fuel the home-rental phenomenon, extra energy may now be coursing through the market. Foreclosures of single-family houses and condos began climbing this summer in the three counties that make up South Florida after declining for years, according to Attom Data Solutions, a research firm. In May, rates were up 4 percent over the previous year, while in June, they shot up 35 percent; in July, it was 29 percent. Florida was one of 21 states to post a year-over-year hike in July. Affected homeowners, who might have fallen behind on mortgage payments because of Hurricane Irma, are in neighborhoods such as Homestead, Opa-locka and Pompano Beach, brokers said. “I hate to say it, but foreclosures are where we do our business. It’s our trigger,” said Dahan, who gets most of his leads from banks, he said. Based on the foreclosure news, he added, two European investment firms are scheduled to visit Miami in October to tour distressed neighborhoods. “It’s going to be a good year,” Dahan said. The ideal home type for the rental market is usually a three-bedroom, two-bath ranch from the 1950s that’s not in a homeowners’ association, which can be a challenge to deal with because such associations ask to screen would-be renters, brokers say. Also, 50-property portfolios are usually a sweet spot, since those types of houses can be in bad shape and need several months of repairs. The idea is to have at least a few up and running immediately, according to Dahan. A portfolio of that size might cost $8 million, Dahan added, up from $5 million a few years ago. If the supply is in place, will renters flock? By some measures, South Florida is rapidly becoming expensive. In Miami-Dade, for example, the median sale price for single-family houses in the second quarter was up 10.3 percent over the same time a year ago, according to the Miami Association of Realtors. Condos, too, seem to be slipping out of reach of many buyers. They averaged $494,000 in the second quarter, up 22 percent from the year-ago quarter, when they were $405,000, according to a Douglas Elliman report. Rental prices are therefore more attractive and affordable. Average rental prices for single-family homes in South Florida are hard to track, but as far as traditional apartments go, two-bedroom apartments in Miami averaged $1,821 a month in September, according to data site RentCafé. Three-bedrooms were $2,174 a month, though the three-bedrooms measured about 1,300 square feet, so they were smaller, perhaps, than a standard house. Aside from renting a home purely because the price is right, millennials like the idea of a home where they can set their own rules and not chafe against the regulations at multifamily complexes, said Robert Rabinowitz, an associate broker with Miami-based The Company Real Estate who represented Gram Group in its Exceptional Homes trade. But not everybody is convinced it’s smart to bet on 20-somethings. “Millennials will eventually marry and have children, and they will become homeowners even if interest rates are going up,” said Neil Merin, the chairman of West Palm Beach-based NAI Merin Hunter Codman, a commercial brokerage. “They’ve watched reality home shows with investors, and they were raised during a recession, so they’re pretty conscious,” Merin said, adding that the home-rental trend seems like a “fad” and so his firm won’t bother with those kinds of deals. But bulls seem to outweigh bears. Dahan says the rental houses that took a month to rent before are now leased in a day. And Jordan Kavana, the chief executive officer of Transcendent Investment Management, an Aventura-based home buyer and renter, says that market attitudes have fundamentally changed. When Transcendent was founded in 2008, it focused on existing buildings. Now, unlike many investors, Transcendent, which announced this summer that it snagged $250 million from Chinese sources, focuses on developing new homes in partnership with local builders, Kavana said. Kavana added that he will develop as many as 3,000 homes for Chinese and other clients in South Florida. Transcendent, which currently has 1,200 rental homes in the tri-county area, plans to deploy $1 billion over the next three years. He added that those existing homes, which Transcendent also manages, boast a 92 percent occupancy rate through the year.